If exhibition attendance were the sole measure of curatorial clout, Lauren Ross, 39, would rank almost as high as the chief curator of MoMA in the New York art world—and she doesn't even work for a museum. Her curatorial domain is the High Line, the elevated park that courses through New York's meatpacking district from Chelsea to the West Village. Since section one (Gansevoort Street to 20th Street) opened in June 2009, it has attracted around two million visitors; if that pace continues, it could near MoMA's 2008-09 total of 2.8 million. Although many visit for the greenery and the view, the park's contemporary art installations are increasingly stealing the limelight. Ross commissions artist projects of varying scales for this unusual patch of the city. These include her work with fellow New York non-profit Creative Time to commission the park's large-scale projects—the first of which was Spencer Finch's glass-work The River That Flows Both Ways, a piece that has occupied a former loading dock near Chelsea Market since last June. The second, a sound work by Stephen Vitiello, opens this June in a tunnel-like passage at 14th Street, and will feature 59 bell tones recorded throughout the city and state, from church and bicycle bells to the bell that opens trading on the New York stock exchange. Ross—whose previous roles include interim curator of the Elizabeth A. Sackler Center for Feminist Art at the Brooklyn Museum and director of alternative New York art space White Columns—directly solicits proposals from artists for the park. "Often it starts with a walk together [on the High Line] to see what appeals to them," she says, as there are no pre-designated spaces for art. She is interested in work that is "engaging both conceptually and formally; the ideas behind a work are important, but it's also important that the visual aspects are striking." And there's another condition: "When you are working in a public space, you have to be aware that you are dealing with a very wide audience. You can't have something obtuse or off-putting. And extremely sexual or violent work is inappropriate for the park." Ross is committed to works in all media, mostly by emerging or mid-career artists. "The important thing is that we are working with a unique space—it's not a museum or gallery, it's not even like any other park," she says. "The pieces have to respond in some way to that uniqueness." 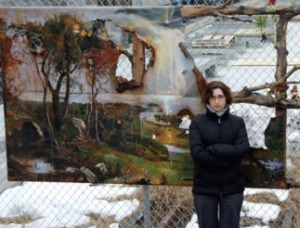 Her first small-scale commission for the High Line went to Valerie Hegarty and was installed last November. The mixed-media piece Autumn on the Hudson Valley with Branches imagines Jasper Francis Cropsey's 1860 painting, Autumn on the Hudson River, as if exposed to nature. "I love that it addresses the clash between nature and culture," says Ross. Next up, in May, is Richard Galpin's Viewing Station. The artist manipulates cityscape photographs by removing the coloured emulsion to bare the paper underneath, creating constructivist-style images. For the High Line he is creating a similar effect via a metal screen with geometric cutouts of the view of surrounding buildings. Viewers will look through an aperture to see his flattened, abstracted vision of the city. A third artist, Kim Beck, will make three blank billboard-style works that refer to empty storefronts and other indicators of the recession, installed on rooftops close to the High Line. Ross is planning two additional works for the autumn and, since the High Line's partnership with Creative Time is ending, she is thinking about further collaborations. "We're in discussions with other potential partners, some non-profit, some for-profit," she says. "That will allow us to do things we can't afford on our own." The works by Finch and Vitiello, for example, cost in the six-figure region and were funded by the Rockefeller Foundation's NYC Cultural Innovation Fund. Ross's smaller commissions cost on average $15,000 to $20,000, "some higher, some lower," she says. Her fundraising efforts will soon need to step up a level as section two of the High Line, stretching from 20th Street to 30th Street, is expected to be completed later this year or by early 2011—creating a bigger canvas for the smaller works and room for at least one more large-scale commission.